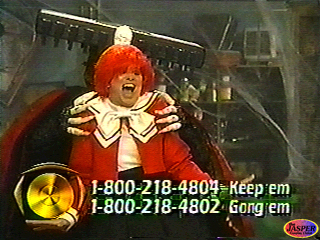 "Z-RAM Bytes the Dust" performance at The Extreme Gong Halloween 1998 Special. Some professional pictures with our friend Leslie. Stalking the halls at Otakon 2000. Kimberly wanted to wear the infamous teal tights at Otakon 2000, and decided to create a new Squirtle Gang character - "Lee van Squirt". Since we are both fans of Spaghetti Westerns, we wanted a distinctive cowboy look. A real black Stetson, sparkly purple chaps, leather boots and plenty of attitude make Lee van Squirt one helleva turtle. Lee van Squirt needed a badass accomplice, something big and mean to keep ornery critters in line. So, we created "Z-RAM the Kid" to assist Lee van Squirt in such nefarious activities as Poké rustlin', gamblin', extortion and squirtin' in public among other things. For this event, I distressed Z-RAM's cape further, by tearing at the surface fibers with a file and rasp. Then, I used leather spray paints to darken and discolor the cape around these "aged" areas. This made Z-RAM look as if he had been through more physical adventures. Sadly, the Lee van Squirt costume was neither recognized nor well-received, because not many American fans seem to have difficulty accepting an original or unfamiliar Pokémon character. Ironically, people did not seem to mind a Poké Ball bandolier and miniature cowboy hat atop Z-RAM. Z-Ram the Kid (Z-RAM v.4.0) and Lee van Squirt raisin' Hell at Otakon. Notice Z-RAM the Kid's Poké Ball bandolier and mini cowboy hat. Z-Ram the Kid's lil' pardner.